After four days of consideration of the claims filed by two opposition candidates disputing the outcome of last month’s presidential election, the Constitutional Court has issued a verdict today confirming the victory of incumbent President Serzh Sargsyan. 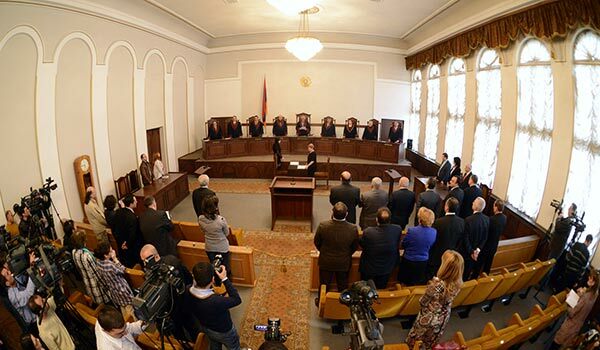 Thus, the Court has found insufficient grounds for invalidating the vote presented by the legal teams of Raffi Hovannisian, the main opposition candidate, and Andrias Ghukasyan, an election outsider. Both candidates also protested what they described as inaction of state bodies, including the Central Election Commission (CEC), the Police and the Prosecutor’s Office, in dealing with “massive, systematic and coordinated riggings and violations” that, in their opinion, swayed the vote in favor of the incumbent. On February 25, the CEC certified Sargsyan as the winner of the election with 58.6 percent of the vote against Hovannisian’s official tally of 36.7 percent. It said reported violations could not affect the outcome of the election. The interests of President Sargsyan in Court were represented by former Justice Minister, lawmaker David Harutyunyan and current Justice Minister Hrair Tovmasyan, both of whom said they were engaged in the legal process as members of the current president’s political team rather than in their official capacity. Hovannisian, who has been on a hunger strike in Yerevan’s Liberty Square since Sunday, is set to continue his protest until Inauguration Day, April 9, warning that President Sargsyan will be sworn in only on his, Hovannisian’s, “dead body”.